I absolutely love the Holidays and Christmas is my very very very favorite Holiday. There is something just blissful about the Christmas season. Most importantly Christ is at the center of it all! Like my mom always said "Jesus is the reason for the season" (she use to make my brother Nick and I wear sweat shirts that said that EVERY CHRISTMAS until we were 12yrs old! lol) plus, who doesn't love Christmas lights, Christmas cookies, Christmas parties, Christmas shopping etc. Well, I use to think that December could not get any better, but boy was I wrong! This December has been the BEST yet! 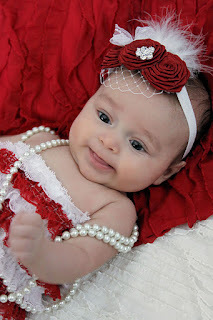 I have said it before, but a baby just makes everything a little brighter :) My little princess Josselyn has brought us more joy than I could have ever imagined! There is nothing more fun that Christmas shopping for a baby. 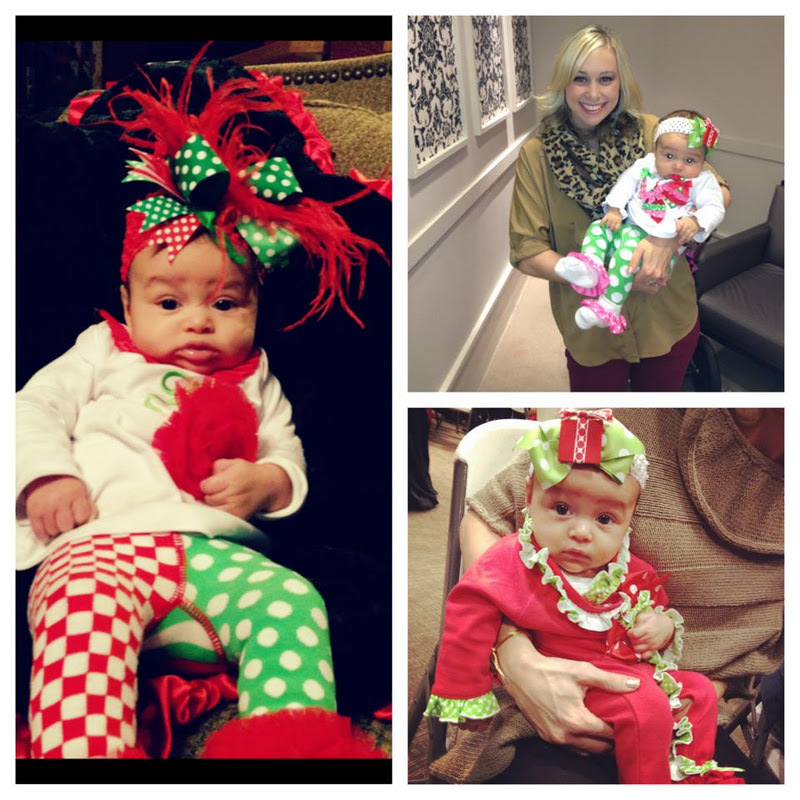 I just LOVE little baby girl Christmas outfits! They are just soooo cute. You may have heard of the 12 days of Christmas but have you heard of Josselyn's 12 outfits of Christmas? 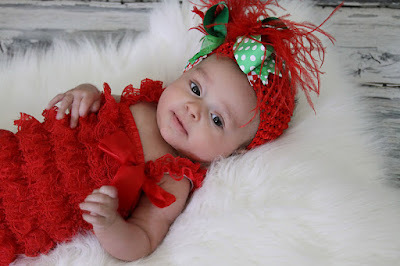 lol (and I am not joking) My poor daughter has been in red & green for the entire month of December! But she only has one month to wear all her red & green so we are making the most of every day until December 25th! Then there is Santa! Who doesn't love Santa Clause??? I have not stood in a line to see Santa in probably 20 years, but this year I got to stand in line so Josselyn could take a picture with the big guy in the red suit. It was sooo much fun! Now I would be lying if I said Josse loved Santa, she actually crinkled her forehead and looked quite unsure when she saw him, but I know she will just grow to love him lol. Then there are Christmas cards! I have always sent Christmas cards to my relatives but that was about it. For some reason I could not justify spending $1 or more on a card with a picture of just John and I to send out to all of our family and friends. Well, now that we have sweet Josse I could not wait to send out our FIRST FAMILY CHRISTMAS CARDS!!! Now if you think 1 baby is cute try seeing 4 Christmas babies together! 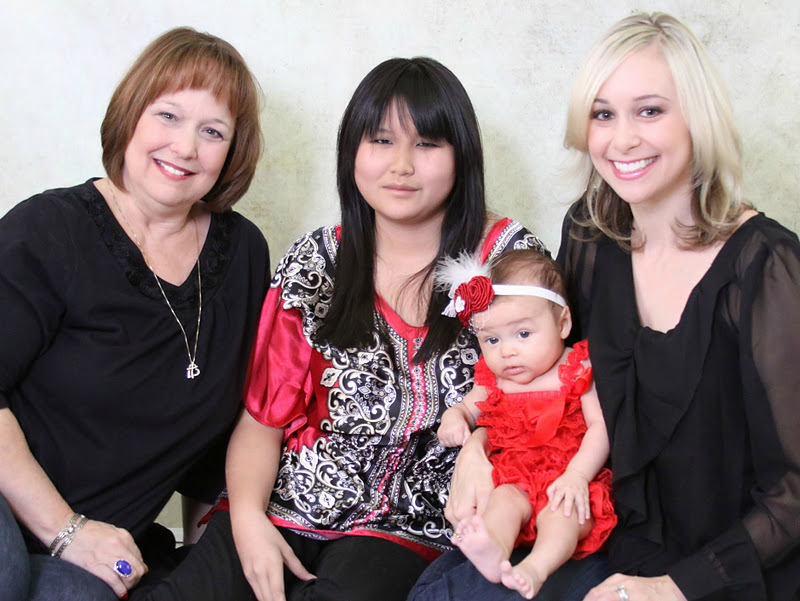 I am so lucky to have 3 other girlfriends with little ones right around Josselyn's age. Our 4 babies are all just weeks apart. 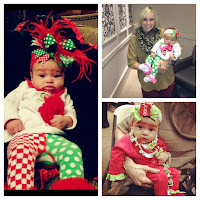 It has been so much fun seeing these adorable Christmas babies all dressed up in their festive, holiday get-up each day :) It has been very reassuring to know that I am not the only new mom who has been dressing their kid in head to toe red and green for the lat twenty something days. Lastly, there are family gatherings. Our family loves getting together during the Holidays and we have quite a few "week before Christmas traditions". It starts with a horse and carriage ride to look at Christmas lights on December 22nd, then we have a family progressive dinner on December 23rd, then on Christmas Eve morning we have a big pancake breakfast and that evening we have Mexican food at Joey & Stacey's house followed by a Christmas Eve candle light service and finally on Christmas Day everyone comes to our house for Christmas lunch. Well, when you add a baby to all of that it just gets BETTER!!! So this December is better than ever and it is not because of any expensive present; actually when John asked me what I wanted for Christmas I said nothing...I honestly feel like I have everything I could ever need or want right now! But don't get me wrong, I'm sure eventually I wouldn't mind a little Louis, Yurman & Tory back in my life lol! But for now I have the absolute BEST present in the world...my little Christmas Baby "Josselyn Grace Alcala"